The Florida Department of Transportation is scheduled to begin a construction project in February on U.S. 17 from Horse Landing Road to the north approach of the bridge, widening the roadway from two to four lanes and install a grassed median approximately one mile of roadway. The road will also be widened for approximately a half-mile south of the bridge. The grassed median will have openings at Islander Road/ Butler Drive, Pineway Avenue and a partial opening at North Dunns Creek Road/San Mateo Road. 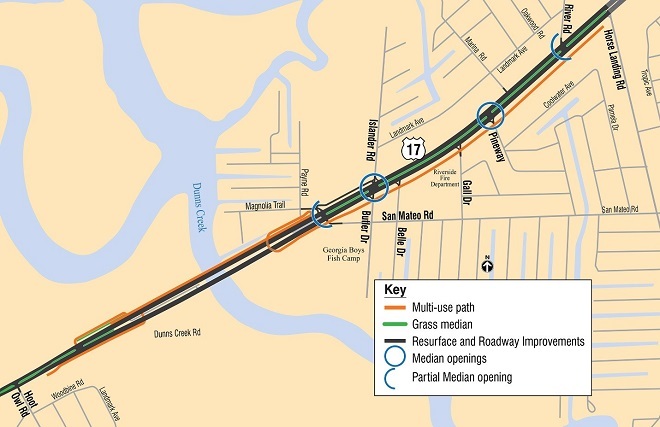 A northbound bypass “Service Road” at North Dunns Creek Road to Islander Drive, adjacent to the south bound travel lanes, will be constructed providing access to U.S. 17 northbound. In addition, the existing Dunns Creek Bridge will be converted to two northbound traffic lanes and a new bridge with two southbound lanes will be built adjacent to it. The project also features a 12-foot wide multi-use path on the east side of the road, connecting to the new path on U.S. 17 south of Horse Landing Road and continuing across the new bridge. Lane closures will not be allowed 6 a.m. to 8:30 a.m. Monday through Friday. No pile driving will be allowed from 7 p.m. to 7 a.m.
GLF Construction was selected to complete the $36.5 million project by summer 2021, weather or unforeseen circumstances permitting. Complete road closure from Landmark Avenue to U.S. 17 tentatively scheduled through Tuesday, April 16 for road work. Follow detour.